Cutting shipping costs is one of the easiest ways to put more money in your pocket when selling online, especially if you are an individual or smaller business selling on websites like eBay or Etsy. 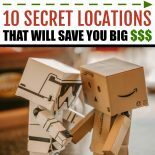 Read on to find out the top 10 places to find FREE shipping supplies and keep shipping costs at zero! It’s no secret that I love eBay — after all, I started making $1,000/month just by selling my old junk between my childrens’ naptimes. One of my best tips for increasing your eBay profits is to lower shipping costs. By keeping eBay shipping costs low (or better yet, at ZERO) you improve your overall profit margin. Less money spent on shipping equals more money in your pocket! 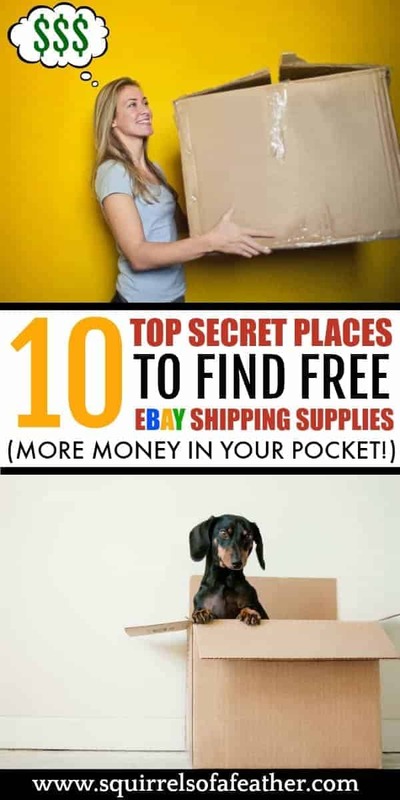 Today I want to share this list of my top 10 favorite places to find free eBay shipping supplies that will keep your costs low. The very best place to get free shipping supplies? Your very own doorstep! Do you order a lot of things from Amazon or have any other frequent online deliveries to your door? STOP! Don’t throw away a single box or padded envelope that you receive. These boxes and packages are pure gold to the online seller! Make sure to also save all padding and shipping bubbles that were sent along with your package! You want to make sure that your items arrive at their new owner’s place in one piece and these items are great to repurpose for shipping protection. Haven’t started using Amazon Prime yet? You are missing out on a lot of great deals and the life-changing service that is two-day shipping — this is especially a lifesaver for new moms or families. Sign up here for a free trial and see how Amazon Prime can improve your life. Friends, Romans, countrymen…lend me your boxes! If you want to make money selling online, allow no shame in your game! Make sure to ask all of your friends and family members to donate their boxes to you. It’s really a win-win situation: less trash for them and more supplies for you! Ask the neighbors that you are friendly with for boxes and envelopes as well. Hey buddy, got any boxes? If you have young children attending daycare or preschools you have wealth of boxes at your fingertips, all in the right sizes. I tend to ship things that are on the smaller side, and I got 20 empty Nutrigrain boxes in one day from my sons’ preschool. These smaller boxes are great for shipping small knicknacks and figurines. 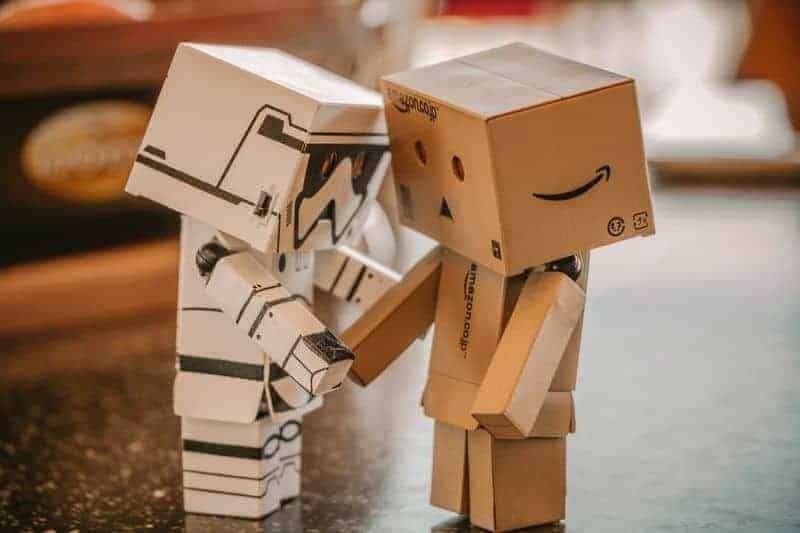 Schools don’t mind sending home boxes with parents. They are often happy to have them end up somewhere other than the trash can. Grocery stores always have an excessive amount of boxes available (I learned this handy information in college during one of my many moves). To get boxes go into the grocery store — the produce section is a good place to start. Typically you will see someone unloading produce or other products right away. 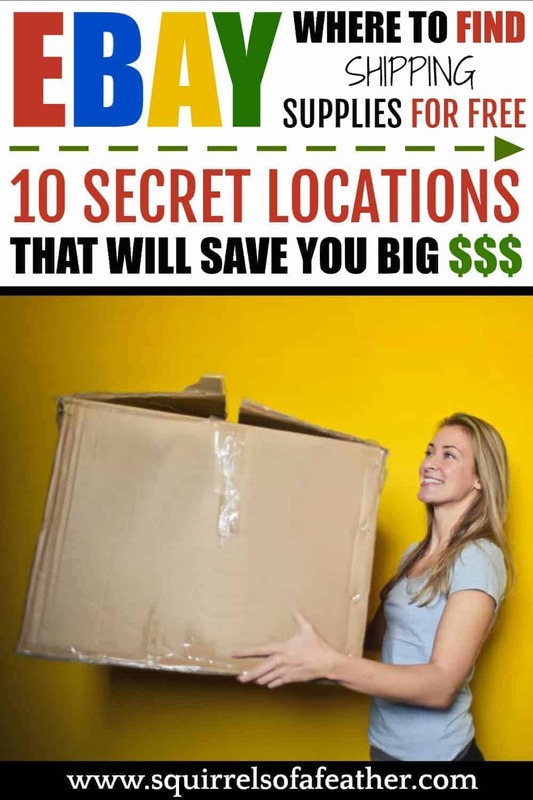 Ask them if they have any boxes (in the size that you want) that you could take. If they aren’t sure, head instead to the customer service desk and put in a request there or ask for a manager to talk to. We currently rent in a townhome community with a HUGE recycling center. There are three massive containers for cardboard boxes alone at our facility! 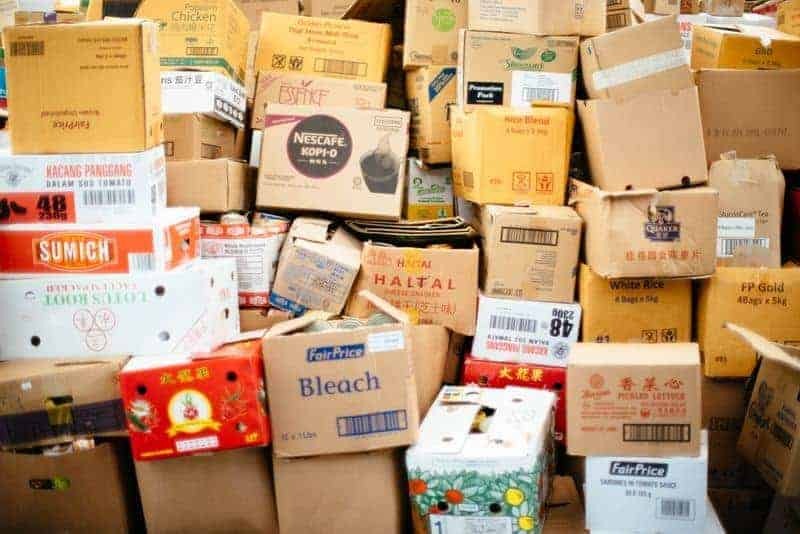 Because of their convinence, trash and recycing centers are usually a number one choice for finding free shipping supplies, with high-quality boxes and packing materials. Pay attention to trash collection days. If you arrive right after they have left, it will be slim pickings for you — the only thing you may find is empty garbage bins! Use common sense when selecting boxes and don’t dig anything out of the trash that is soiled or smelly! Your customers will not be happy if their item arrives stinking like coffee grounds or moldy cheese. Please be courteous and remove any neighbors’ personal addresses and other labels as well! Boxes and hangers and plastic bins, oh my! — those are some item Goodwill never seem to run out of. If you often find yourself at your local Goodwill, ask if you can take some of their boxes. They might even direct you to the back where the boxes are piled up in containers to be trashed. Stuff everything you can fit in your trunk and call it a day. Especially during prime months of renting turnover (like summer and before school starts), Craigslist is a great resource for finding free boxes. 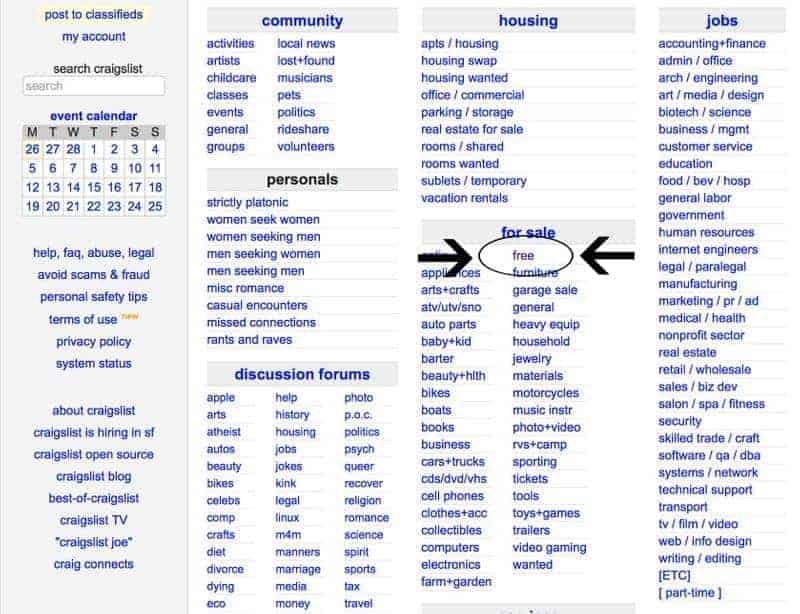 Just go to your local Craigslist and look for the “FREE STUFF” label and click. Then search for “boxes”. I ran a test search in the middle of winter and instantly came up with 33 results, so there are plenty of boxes out there! Just like Craigslist, Facebook Marketplace is a great way to find local people trying to get rid of their boxes. Remember to expect that you will need to be able to pick up and transport any boxes yourself with both Craigslist and Facebook Marketplace. No one is going to want to drop off free boxes to you! Both Facebook Marketplace and Craigslist often operate on a “first come, first serve” basis. If you spot a great deal, contact the lister quick before someone else does! Anyone can pick up Priority Mail Flat Rate boxes for free from the post office. You literally can just walk in and grab them, any size and amount, and walk back out. USPS Priorty Mail Flat Rate boxes are good for shipping things that might be heavy or cost a lot to ship far away. While the boxes are free, the shipping isn’t. To use Priority Flat Rate shipping you pay a flat rate per each box to ship anywhere in the USA; as the size of the box increases, so does the price. Just like Vanessa Williams, I went and saved the best for last! Michael’s (a craft supply store, for you non-crafters) has boxes in every shape and size imaginable, and they are perfectly okie-dokie with people just pulling up, loading up their car, and driving away. If you are in need odd-shaped boxes this is the place to look! You can ask the friendly employees inside your local Michael’s what the best pickup days are; in our area it is Tuesdays and Thursdays! Now get out there and start saving money on shipping supplies! 75 Crazy Things to Sell for Fast Cash on eBay RIGHT NOW!